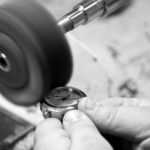 Though most watches are built to last a lifetime, watches are subject to everyday stresses from scratches from wear and tear to water damage and more. Here are some frequently asked questions about watch problems. I dropped my watch and now it won’t run. A common problem that happens when the watch isn’t worn enough to wind the watch from your movement. This causes the power supply to run low, low enough that there isn’t enough to run the watch. Far less likely, but possible is that the mainspring has worn down over the years and can be fixed by replacing it. My watch was running fine for a long time and now it’s slow and stopping. Like any machine, it needs to be lubricated to run well and every 3-5 years it needs to be re-lubricated. Over time the oil that lubricated to parts inside the watch can move around and cause parts to stick that shouldn’t, like the mainspring. It could also be a result of dropping the watch and causing the hairspring to be out of adjustment or even that the watch has become magnetized. Sometimes this happens because the watch needs to be wound, either by hand or with the automatic winding mechanism that uses the motion of your wrist to wind the watch. If the watch is fully wound and still running slow that just means that your needs some maintenance from a watchmaker, usually every 4-5 years. In a hand wound movement this would mean that the mainspring is broken and needs to be replaced. The crystal on my watch keeps fogging up and I can’t see the dial. You may need to replace the gaskets inside the watch that help keep the watch water resistant. If the crown was not pushed back in, water may have gotten into the case and is causing the fogginess. The watch needs to be serviced right away because some internal parts may have been damaged from water getting inside the watch. The hands are off by 12 hours. Reset the watch manually by changing the time by 12 hours. Check the battery first to see if it needs to be replaced. Watch batteries usually last for around 2 years before needing to be replaced. This might mean that some gear inside the watch isn’t working properly even though the electronic component is working. The watch needs to be serviced from a watchmaker to get the watch running well again. My watch runs fine when I don’t wear it, but it stops when I put it on. A common occurrence in quartz watches because there could be a defect in the circuits. Over time and temperature changes (like heating up when wearing the watch) the circuit can have a bad contact or defect. When you take the watch off it goes back to room temperature and works smoothly again. Take the watch to get checked out and they should replace the circuit and do some general servicing. Watches sometimes have a feature that have an indicator of when the battery power is getting low, called the battery end-of-life indicator (EOL). This lets you know the battery needs to be replaced by moved the second hand erratically and will resolve itself once you have installed a new battery. Watch batteries usually last for about 2 years and using the chronograph functions frequently use up the power more quickly because they require more power to run than just telling the time. Take care to stop these functions when not using them to converse battery power. You really don’t need to replace the battery until your watch tells you its time with the end-of-life indicator (EOL). Opening the watch back unnecessarily can compromise the seal of the watch and therefore the water resistance. A battery should last for 1-2 years but it just depends on how many complications/functions (ex. alarms, stopwatch, etc) the watch has and how old it is. This could be a few things but the most common issue is that the contact spring for the alarm is not in the right position. Of the watch back was not put back on correctly after replacing the battery and now there’s a problem with the alarm contact plate. Sending it to a watchmaker for maintenance will fix the issue. This happens typically when the watch has been dropped or banged against something and the digital display has been damaged. This is usually a very expensive repair and often not worth the cost to repair, depending on the value. Higher end watches have to be sent to the manufacturer to be fixed. If the watch was dropped, the circuitry contacts have been damaged or they have been corroded. When this happens, it means that parts of the display are not getting enough voltage from the circuit to light up the digits. This repair can cost just as much as replacing the watch and would need to be sent to the manufacturer to be fixed. The hands work but the digital display doesn’t, or vice versa. Analog/digital combination watches are really two watches built together. It is possible that one will malfunction leaving one part working. 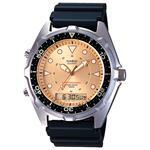 Watches with a digital feature must be repaired by the manufacturer’s service center. The push buttons don’t push in or will not return after being pushed in. 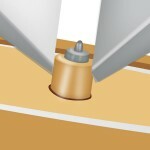 Push buttons work much like a pen top, a stem and spring work together to move it in and out of the tube on the watch. Over time the inside of the tube gets dirty or corrodes and the spring isn’t able to push the button back up when its released. The spring needs to be replaced and the tube cleaned by a watchmaker. The back of my Studio watch fell off and is lost. Can you sell me a replacement back for it? If not, please tell me where I can obtain one. Unfortunately we cannot supply watch backs. You could try contacting the manufacturer about a replacement. I want to put a Seiko LaSalle 7430-5169 back to running condition. I received the watch in non-running condition. The crown is missing. I have a replacement. I can see a stem, pretty far below the opening in the movement for the stem. 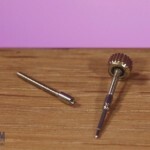 The stem is too short for the crown to be simply put through the hole in the case and thread onto the stem. where is the stem release on the movement, and how do I extract a short stem from the movement?